Planning a brunch for Mother’s Day? Why not add some blueberries to your meals. Christine Tizzard was here this morning with some great recipes. This week, TODAY is exploring longevity foods with unique, health-boosting properties that may help you live longer. With plenty of fiber and different vitamins, many fresh fruits are great for you — but we’re truly wild for wild blueberries. The challenge to eating healthy never ends and what might be right for you may not be right for some. Christine Tizzard is known as the 3-way Chef and Author of the cookbook “Honest to Goodness” and she is here today to show her tremendous wild blueberry breakfast porridge. As a migraine sufferer, every wine I’ve tried has given me a headache – except for blueberry wine. Any idea why? I love sweet wine, but being a migraine sufferer, every wine I’ve tried has given me a headache. Recently I discovered blueberry wine. No pain, and I am thrilled. Do you know why no headache? This wild blueberry pear ginger galette by Kara Lydon of The Foodie Dietitian combines the juicy, soft taste of pears with zesty ginger, sweet and tart wild blueberries and a buttery-rich crust. 10 Breakfasts to Boost Metabolism Before 8 a.m.
Get your metabolism moving with this protein-packed smoothie featuring delicious Wild Blueberries. 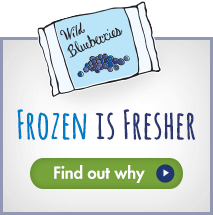 Wild blueberries, fresh or frozen, add sweetness and less sugar than many other fruits, including bananas or cultivated blueberries.